Mercury is one of the basic chemical elements. It is a heavy, silvery metal that is liquid at normal temperatures. Mercury readily forms alloys with other metals, and this makes it useful in processing gold and silver. Much of the impetus to develop mercury ore deposits in the United States came after the discovery of gold and silver in California and other western states in the 1800s. Unfortunately, mercury is also a highly toxic material, and as a result, its use has severely declined over the past 20 years. Its principal applications are in the production of chlorine and caustic soda, and as a component of many electrical devices, including fluorescent and mercury-vapor lamps. Mercury has been found in Egyptian tombs dating to about 1500 B.C. , and it was probably used for cosmetic and medicinal purposes even earlier. In about 350 B.C. , the Greek philosopher and scientist Aristotle described how cinnabar ore was heated to extract mercury for religious ceremonies. The Romans used mercury for a variety of purposes and gave it the name hydrargyrum, meaning liquid silver, from which the chemical symbol for mercury, Hg, is derived. Demand for mercury greatly increased in 1557 with the development of a process that used mercury to extract silver from its ore. The mercury barometer was invented by Torricelli in 1643, followed by the invention of the mercury thermometer by Fahrenheit in 1714. The first use of a mercury alloy, or amalgam, as a tooth filling in dentistry was in 1828, although concerns over the toxic nature of mercury prevented the widespread use of this new technique. It wasn't until 1895 that experimental work by G.V. Black showed that amalgam fillings were safe, although 100 years later scientists were still debating that point. Mercury found its way into many products and industrial applications after 1900. It was commonly used in batteries, paints, explosives, light bulbs, light switches, pharmaceuticals, fungicides, and pesticides. Mercury was also used as part of the processes to produce paper, felt, glass, and many plastics. In the 1980s, increasing understanding and awareness of the harmful health and environmental effects of mercury started to greatly outweigh its benefits, and usage began to drop sharply. By 1992, its use in batteries had dropped to less than 5% of its level in 1988, and overall use in electrical devices and light bulbs had dropped 50% in the same period. The use of mercury in paints, fungicides, and pesticides has been banned in the United States, and its use in the paper, felt, and glass-manufacturing processes has been voluntarily discontinued. Worldwide, production of mercury is limited to only a few countries with relaxed environmental laws. Mercury mining has ceased altogether in Spain, which until 1989 was the world's largest producer. In the United States, mercury mining has also stopped, although small quantities of mercury are recovered as part of the gold refining process to avoid environmental contamination. China, Russia (formerly the USSR), Mexico, and Algeria were the largest producers of mercury in 1992. Mercury is rarely found by itself in nature. Most mercury is chemically bound to other materials in the form of ores. The most common ore is red mercury sulfide (HgS), also known as cinnabar. Other mercury ores include corderoite (Hg 3 S 2 Cl 2 ), livingstonite (HgSb 4 S 8 ), montroydite (HgO), and calomel (HgCl). There are several others. Mercury ores are formed underground when warm mineral solutions rise towards the earth's surface under the influence of volcanic action. They are usually found in faulted and fractured rocks at relatively shallow depths of 3-3000 ft (1-1000 m). Other sources of mercury include the dumps and tailing piles of earlier, less-efficient mining and processing operations. The process for extracting mercury from its ores has not changed much since Aristotle first described it over 2,300 years ago. Cinnabar ore is crushed and heated to release the mercury as a vapor. The mercury vapor is then cooled, condensed, and collected. Almost 95% of the mercury content of cinnabar ore can be recovered using this process. 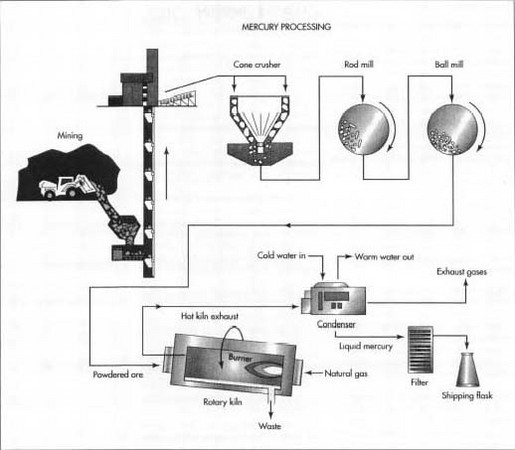 Here is a typical sequence of operations used for the modern extraction and refining of mercury. Cinnabar ore occurs in concentrated deposits located at or near the surface. About 90% of these deposits are deep enough to require underground mining with tunnels. The remaining 10% can be excavated from open pits. 1 Cinnabar is dislodged from the surrounding rocks by drilling and blasting with explosives or by the use of power equipment. The ore is brought out of the mine on conveyor belts or in trucks or trains. Because cinnabar ore is relatively concentrated, it can be processed directly without any intermediate steps to remove waste material. 2 The ore is first crushed in one or more cone crushers. A cone crusher consists of an interior grinding cone that rotates on an eccentric vertical axis inside a fixed outer cone. As the ore is fed into the top of the crusher, it is squeezed between the two cones and broken into smaller pieces. 3 The crushed ore is then ground even smaller by a series of mills. Each mill consists of a large cylindrical container laying on its side and rotating on its horizontal axis. The mill may be filled with short lengths of steel rods or with steel balls to provide the grinding action. 4 The finely powdered ore is fed into a furnace or kiln to be heated. Some operations use a multiple-hearth furnace, in which the ore is mechanically moved down a vertical shaft from one ledge, or hearth, to the next by slowly rotating rakes. Other operations use a rotary kiln, in which the ore is tumbled down the length of a long, rotating cylinder that is inclined a few degrees off horizontal. In either case, heat is provided by combusting natural gas or some other fuel in the lower portion of the furnace or kiln. The heated cinnabar (HgS) reacts with the oxygen (02) in the air to produce sulfur dioxide (SO 2 ), allowing the mercury to rise as a vapor. This process is called roasting. 5 The mercury vapor rises up and out of the furnace or kiln along with the sulfur dioxide, water vapor, and other products of combustion. A considerable amount of fine dust from the powdered ore is also carried along and must be separated and captured. 6 The hot furnace exhaust passes through a water-cooled condenser. As the exhaust cools, the mercury, which has a boiling point of 675° F (357° C), is the first to condense into a liquid, leaving the other gases and vapors to be vented or to be processed further to reduce air pollution. separate and capture any mercury, which may have formed compounds. Most commercial-grade mercury is 99.9% pure and can be used directly from the roasting and condensing process. Higher purity mercury is needed for some limited applications and must be refined further. This ultrapure mercury commands a premium price. 8 Higher purity can be obtained through several refining methods. The mercury may be mechanically filtered again, and certain impurities may be removed through oxidation with chemicals or air. In some cases the mercury is refined through an electrolytic process, in which an electric current is passed through a tank of liquid mercury to remove the impurities. The most common refining method is triple distillation, in which the temperature of the liquid mercury is carefully raised until the impurities either evaporate or the mercury itself evaporates, leaving the impurities behind. This distillation process is performed three times, with the purity increasing each time. 9 Commercial-grade mercury is poured into wrought-iron or steel flasks and sealed. Each flask contains 76 lb (34.5 kg) of mercury. Higher purity mercury is usually sealed in smaller glass or plastic containers for shipment. Commercial-grade mercury with 99.9% purity is called prime virgin-grade mercury. Ultrapure mercury is usually produced by the triple-distillation method and is called triple-distilled mercury. Quality control inspections of the roasting and condensing process consist of spot checking the condensed liquid mercury for the presence of foreign metals, since those are the most common contaminants. The presence of gold, silver, and base metals is detected using various chemical-testing methods. Triple-distilled mercury is tested by evaporation or spectrographic analysis. In the evaporation method, a sample of mercury is evaporated, and the residue is weighed. In the spectrographic analysis method, a sample of mercury is evaporated, and the residue is mixed with graphite. Light coming from the resulting mixture is viewed with a spectrometer, which separates the light into different color bands depending on the chemical elements present. Mercury is highly toxic to humans. Exposure may come from inhalation, ingestion, or absorption through the skin. Of the three, inhalation of mercury vapor is the most dangerous. Short-term exposure to mercury vapor can produce weakness, chills, nausea, vomiting, diarrhea, and other symptoms within a few hours. Recovery is usually complete once the victim is removed from the source. Long-term exposure to mercury vapor produces shaking, irritability, insomnia, confusion, excessive salivation, and other debilitating effects. In normal situations, most exposure to mercury comes from the ingestion of certain foods, such as fish, in which the mercury has accumulated at high levels. Although mercury is not absorbed in great quantities when passing through the human digestive system, ingestion over a long period of time has been shown to have cumulative effects. In industrial situations, mercury exposure is a far more serious hazard. Mining and processing mercury ore can expose workers to mercury vapor as well as to direct contact with the skin. The production of chlorine and caustic soda can also cause significant mercury exposure hazards. Dentists and dental assistants can be exposed to mercury while preparing and placing mercury amalgam fillings. Because mercury poses a serious health hazard, its use and release to the environment has come under increasingly tight restrictions. In 1988, it was estimated that 24 million lb/yr (11 million kglyr) of mercury were released into the air, land, and water worldwide as the result of human activities. This included mercury released by mercury mining and refining, various manufacturing operations, the combustion of coal, the discarding of municipal refuse and sewage sludge, and other sources. In the United States, the Environmental Protection Agency (EPA) has banned the use of mercury for many applications. The EPA has set a goal of reducing the level of mercury found in municipal refuse from 1.4 million Ib/yr (0.64 million kg/yr) in 1989 to 0.35 million lb/yr (0.16 million kg/yr) by 2000. This is to be accomplished by decreasing the use of mercury in products and increasing the diversion of mercury from municipal refuse through recycling. Mercury is still an important component in many products and processes, although its use is expected to continue to decline. Improved handling and recycling of mercury are expected to significantly reduce its release to the environment and thereby reduce its health hazard. Kroschwitz, Jacqueline I., executive editor, and Mary Howe-Grant, editor. Encyclopedia of Chemical Technology, 4th edition. John Wiley and Sons, Inc., 1993. Raloff, J. "Mercurial Airs: Tallying Who's to Blame." Science News (February 19, 1994): 119. Spencer, Peter, and G. Murdoch. "Mercury in Paint." Consumers' Research Magazine (January 1991): 2. Stone, R. "Mercurial Debate." Science (March 13, 1992): 1356-1357. Mercury is also used in lighthouses with large rotating optics floating on it. Someone forgot to mention Thymerisol which is mercury and it is used in vaccines as a preservative. Currently a child in the US may receive up to 30 vaccines by the time they reach 4 years old. At the same time Autism has increased by 80% in just the past 10 years. Mercury causes madness the best known example being The Hatters Tea Party. Since mercury was used in the manufacture of felt hats the expression "as mad as a hatter" came about. So we are all going mad together by burning coal etc. and by shooting it into the veins of our children. I worked in an environmental laboratory assigned in a provincial area. One time, I sent ore sample with high mercury content, 1 kilogram, wrapped in a plastic bag, sealed, then placed in a carton/box. This is for Mercury and Gold Analysis. This was shipped together with 5 water samples placed inside PET bottles, sealed. The parameters for these 5 water samples includes Mercury analysis. Question: Is there a possibility that the water samples be contaminated with Mercury knowing that the water samples are sealed? Hope to receive answer. Thank you.